What does one do on a cold winter night in a secluded cabin in the woods? Drink Hot Toddy's of course...now what were you thinking?? 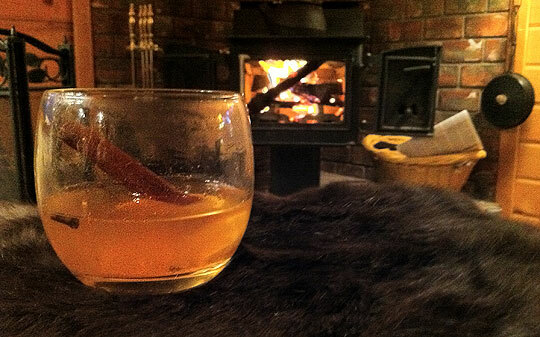 And what makes this Hot Toddy better than any other you've ever had? Barenjager Honey Liqueur. Made with real honey; Barenjager has a pronounced honey flavor that mixes well in different recipes and is even better straight up. I'm bringing this special Honey Hot Toddy to our Virtual Potluck Holiday Party. Don't forget to stop by all of the other VP blogger's pages to see what they are serving up. Pour boiling water and whiskey into a mug. Spice it with the cloves and cinnamon, and put in the slice of lemon. Let the mixture stand for 5 minutes so the flavors can mingle, then sprinkle with a pinch of nutmeg before serving. I think I could use one of these this evening or maybe earlier! Now we're talking! Looks great. It's always the desserts that catch my attention. They look fabulous! Happy New Year!